Congregations modify Ash Wednesday services, hold prayer vigils, provide counseling, promise on-going pastoral care. 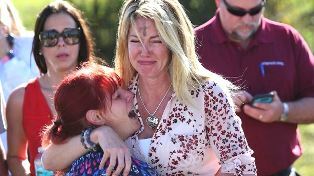 PARKLAND, FL (ANS – February 15, 2018) — Many churches in southern Florida modified preplanned Ash Wednesday services to become prayer vigils in the wake of a deadly school shooting Wednesday afternoon at the Stoneman Douglas High School in Parkland. Seventeen students and adults were killed and more than a dozen were injured Wednesday afternoon when a former student carrying an AR-15 rifle entered the school building and began shooting. It was the 9th school shooting to occur this year. Police have interrupted plans for a number of other shootings. According Jim Skillington, writing for the Disaster News Network (http://www.disasternews.net/), First Church, a United Methodist Church in Coral Springs, announced on its Facebook page that it planned a time of Prayer and to have Pastors available to talk after the Ash Wednesday service. He said that the Presbytery of Tropical Florida also promised to support anyone in need following the shooting. According to Jim Kirk of Presbyterian Disaster Assistance, the Presbytery had begun an assessment of need. The Salvation Army in Broward County said that in addition to providing a mobile kitchen for first responders, it was coordinating its response with the Broward Emergency Operations Center to identify ongoing needs. 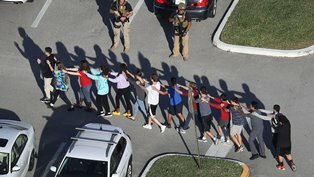 “It is a day you pray every day you don’t have to see,” Robert W. Runcie, the superintendent of Broward County Public Schools, told reporters. “We have grief counselors and crisis teams ready to assist,” Runcie wrote in a statement posted on the school system’s Website. “Dealing with this tragedy is going to take time – and we will be here for every student, every family, and every staff member. It is the second mass shooting in Broward County, Florida, in a year. In 2017 a passenger shot a number of people at the Fort Lauderdale airport. A YouTube user named “Nikolas Cruz” reportedly posted “I’m going to be a professional school shooter” on the site. Cruz was taken into custody off campus about an hour after he “committed this horrific, detestable act,” said Israel, who added investigators were reviewing social media postings that he described as “very disturbing.” The suspect was treated for “labored breathing” as a precaution but was later released from the hospital, according to officials. The FBI was alerted six months ago after a YouTube user named “Nikolas Cruz” posted a comment stating “I’m going to be a professional school shooter” on the video site, BuzzFeed reported early Thursday. He lived here without any concerns or issues for almost three months, and they are shocked and horrified by the allegations being made,” the lawyer, Jim Lewis, said, adding that his clients are fully cooperating with investigators. The gunfire began outside the school and continued inside, where 17 of the victims were killed, Israel said. So, once again, another shocking event of gun violence has taken place in America. The question is: When will it stop, and what action will be taken by the US goverment to stop it? With their past record, I say Don’t hold your breath. Photo captions: 1) Nikolas Cruz was booked into Broward County Jail on 17 counts of premeditated murder. 2) Terrified students leaving the scene. 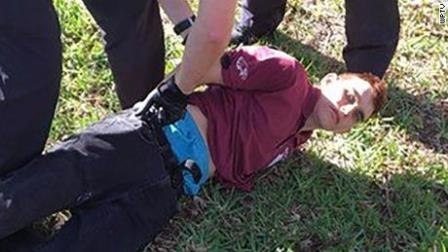 3) The moment Nikolas Cruz was captured after the Parkland school shooting. 4) Parents wait for news after a reports of a shooting at Marjory Stoneman Douglas High School in Parkland, Florida. 5) Dan Wooding recording his radio show. About the writer: Dan Wooding, 77, is an award-winning author, broadcaster and journalist who was born in Nigeria of British missionary parents and is now living in Southern California with his wife Norma, to whom he has been married for nearly 55 years. They have two sons, Andrew and Peter, and six grandchildren who all live in the UK. He is the author of some 45 books and has two TV programs and one radio show in Southern California.